Roxy-Pacific Holdings Limited places great importance on social responsibility and contributes in numerous ways to the communities within which it operates. We are a strong believer in giving back to society beyond our professional business commitment; therefore, Corporate Social Responsibility (CSR) is a fundamental strategic priority for us. This year, as each year, our CSR initiatives cover a variety of important initiatives that include children's wellbeing and elderly care. We select our corporate social initiatives by considering our role and capabilities and focusing on areas where we can play our part in making the overall environment a better place for the community. n 2017, we were excited to enter the tenth year of our children's initiative "Children Are Our Hope for the Future", which was launched in 2007. Over the last ten years, this has been our prominent CSR initiative through which we have reached out to children with the aim of improving their living standards and quality of life. The Group commits funds to social causes close to our hearts through our foundation, Roxy Foundation. The Foundation is administered by the "Community Foundation of Singapore". Funds from the Foundation are boosted by donation raised from the event that we hold during the year and which are supported and organised by our employees who are happy to devote a portion of their time to these causes. Our prominent annual car wash fund-raising was held once again on 12th May 2017. This year, 90 voluntary employees divided into teams and work in rotation, dedicated their time for the event that lasted 8 hours and washed a total of 104 vehicles. The car washing event raised a total of S$134,000 which includes funds committed from Roxy-Pacific Holdings Limited. To celebrate the tenth year of "Children Are Our Hope for the Future" initiative, we organised a celebratory dinner on the 27th of July. The dinner was intended to show our appreciation to our business associates and long-time supporters for their generous donations over the years. During the dinner, we received voluntary assistance from Swiss Cottage Secondary School's students as well as 15 voluntary employees and we prepared an enjoyable fun-filled dinner for 320 attendees. 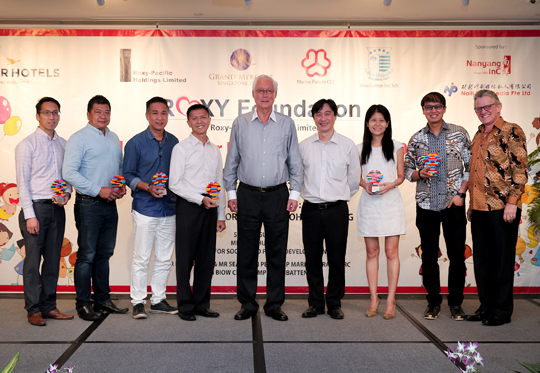 We were honored to welcome the Emeritus Senior Minister, Goh Chok Tong as our guest of honour. The dinner also served as a platform for distributing a portion of funds raised from the car washing event. We were thrilled to donate the sum of $25,000 to the South East Community Development Council for Roxy Children's Fund. This fund is used to support 6 family service centres within the district. In addition, a total of $56,100 is awarded to the following students; 137 selected primary and secondary students received vouchers of S$300 each and 15 Nanyang Polytechnic students were awarded S$1,000 individually to support their tertiary education fund. 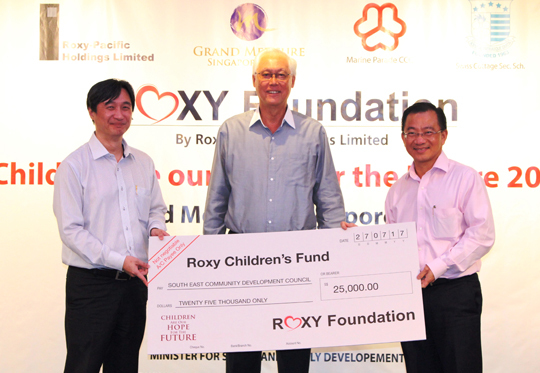 Mr Teo Hong Lim, Chairman & CEO of Roxy-Pacific Holdings Limited presenting the cheque to Mr Seah Kian Peng, Vice Chairman of South East CDC for the Roxy Children's Fund, witnessed by Emeritus Senior Minister Goh Chok Tong. 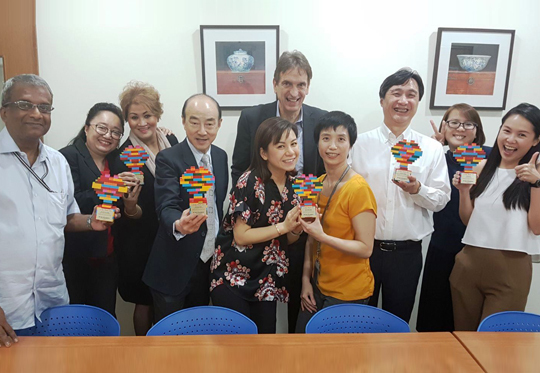 Token of appreciation hand-made by the Corporate Social Responsibility Team together with Mr Klaus Gottschalk and Mr Teo Hong Lim, for our generous and committed business associates and supporters in the "Children Are Our Hope for the Future" initiative. Mr Klaus Gottschalk, General Manager of Grand Mercure Singapore Roxy and Mr Chris Teo, Managing Director of Roxy-Pacific Holdings Limited, together with voluntary staffs of both companies participating in the car wash fund-raising event. Presenting our handmade token of appreciation. (Left to Right) - Mr Lim Wei Liang (Naili Print Media Pte Ltd), Mr Ernest Chua (CSH Landscapes & Construction), Mr Don Ho (Nanyang Inc. Pte Ltd), Mr Heng Yew Seng (Swiss Cottage Secondary School) , Emeritus Senior Minister Goh Chok Tong , Mr Teo Hong Lim (Roxy-Pacific Holdings Limited), Ms Ng Li Peng (Marine Parade CCC), Mr Glenn Ong & Flying Dutchman (One FM 91.3). On 16th June, in the month of Ramadan, 17 employees carried out our yearly "Breaking of Fast" activity with children from Jamiyah Children Home. In line with the practice of previous years, we contributed a donation of S$5,000 to the home as well as covering the cost of dinner whilst creating a festive mood for the children. For this event, Ms Fatimah Lateef, MP of Marine Parade GRC is also present to join in on our celebration. Finally, as part of the Group's continuous efforts to bring excitement and fun, and not just financial support, into the lives of these children, we arranged a "Family Movie Day" on 7th September. We were joined by 248 children and families from St Hilda's Community and Montfort Care to watch "Disney Cars 3" at i12 Katong cineplex. lderly care is our other key CSR pillar. We proactively take part in community initiatives which make positive impacts to the lives of the elderly in order to show our gratitude for the contributions made by them towards our nation. At the beginning of the year, we hosted a Chinese New Year Banquet for the senior citizens of St Hilda's Community Services. The celebration took place on 9th February and proved to be a highly entertaining affair with 270 seniors' participation. 36 of our employees joined students from Tanjong Katong Secondary School in serving our seniors during the banquet and with entertaining performances. We also once again organised a Hari Raya shopping trip on 15th June for 15 senior citizens from Montfort Care. 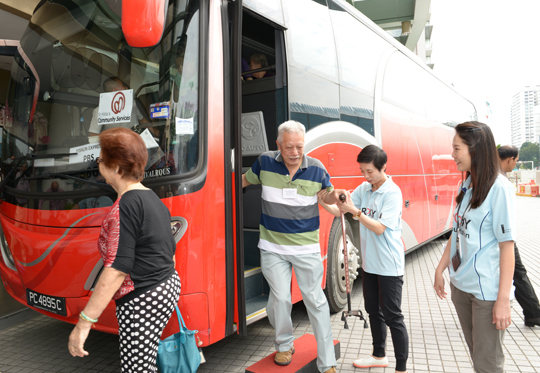 The senior citizens were each given S$50 to spend during the outing. They were taken care by 30 volunteers comprises of our employees and students from Victoria School. Everyone had a pleasant and enjoyable time immersing themselves in festive shopping. To finish the day, our employees and the seniors break fast together at the centre. Senior citizens arriving from St Hilda's Community Services for Chinese New Year Banquet. Hari Raya shopping for the senior citizens from Montfort Care. wice a year, we engage with the Salvation Army Evangeline Booth girls' home in Medan, Indonesia. For each trip, we will seek collaboration with secondary school in Singapore to partner with us for the visit. Thru the visits, we want to encourage interaction between the girls and the students; giving the girls exposure to the happenings that is outside of their village. Each time, apart from visiting the home and spending time with the girls, we will also purchase and bring along necessities that are needed at the home, depending on their needs at the time. During our October 2017 visit, St Andrews Secondary School in Singapore collaborated with us and we also brought along cleaning equipment and washing agents to top up their supplies. A total of 18 students and 3 teachers joined us in visiting the home; they interacted and participated in various activities together with the girls such as sports and games during the 2 days visitation. 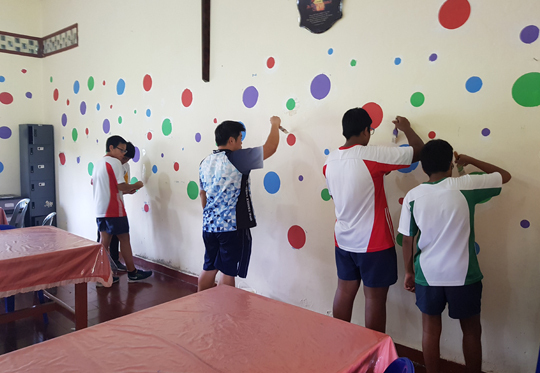 The highlight of this visit is to re-decorate the girls' dining room which the Singapore students did it by manually painting and designing the walls with bright coloured paints. During this visit, the Singapore students and teachers also glimpsed insight into Indonesian school's culture and lesson proper as they paid a visit to a local secondary school. Also a part of our tradition, in December, we supported the girls in their annual Christmas outing where they were given the opportunity to shop and choose new clothes for themselves. On Christmas day, we hosted a small scale dinner party which we enjoyed together with the girls at the home. St Andrew's Secondary School students re-decorating Evangeline Booth girls' home in Medan. 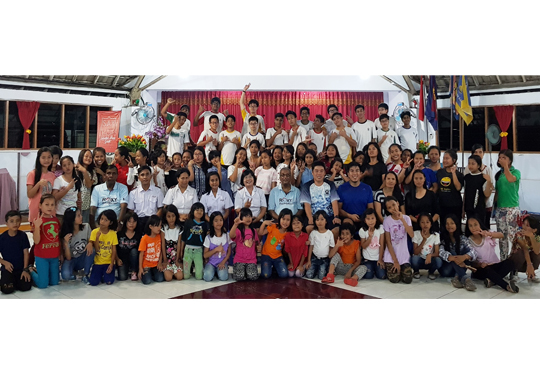 Students and teachers from St Andrew's Secondary School as well as representatives from the CSR team, together with the girls of Salvation Army Evangeline Booth, Medan. Annual Christmas outing for the girls from Salvation Army Evangeline Booth, Medan. part from these yearly activities and various donations that we contributed, we also extend our support to local events whenever we can. This year, we took part in the Ground Zero Run for Humanity organised by Mercy Relief on 13th August 2017. Held in observance of World Humanitarian Day, 41 of our employees were challenged with a simulated experience of a survivor's journey from ground zero, a disaster site, to safety. Participants had to collect urgent supplies needed in the immediate aftermath of a disaster and carry a relief pack weighing 5kg for a chosen distance. 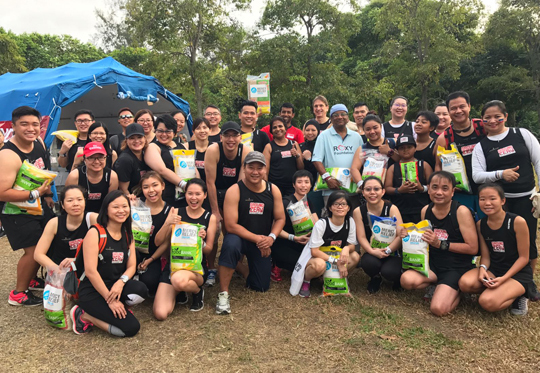 Our employees participating in the Ground Zero Run for Humanity on 13th August 2017.